Mini pickup. Exhibit at Grampian Transport Museum. 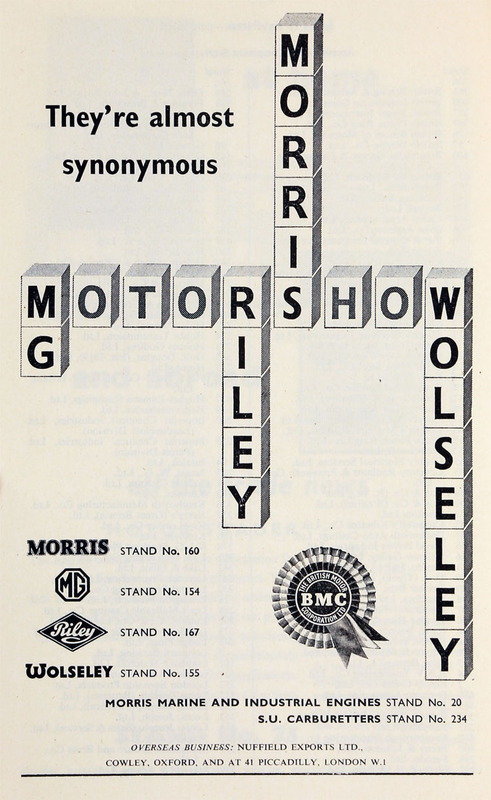 1952 The British Motor Corporation (BMC) was formed by the merger of Austin and the Nuffield Organization (parent of the Morris, MG, Riley and Wolseley). 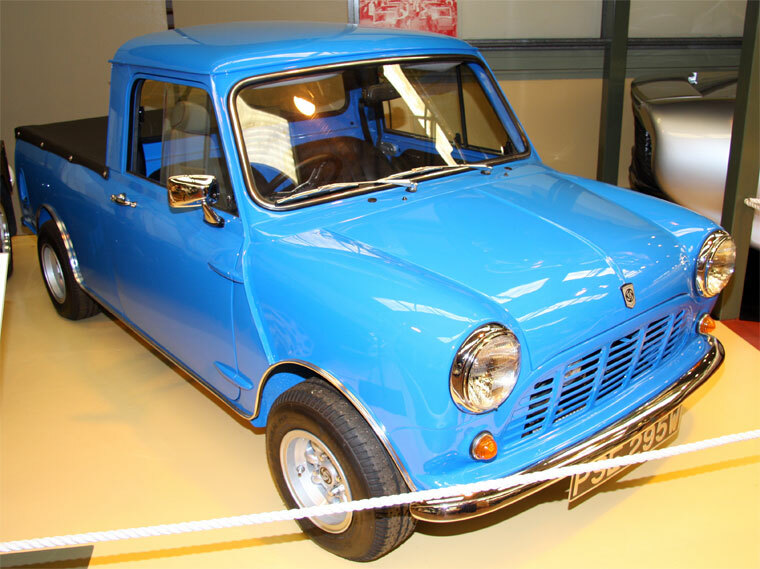 It was the largest British car company of its day, and substantially larger than any other European car company, with around 39 percent of British output, producing a wide range of cars under various brand names as well as commercial vehicles and agricultural tractors. It also included MG and Austin-Healey marques. The first chairman was Lord Nuffield (William Morris), with Leonard Lord as Deputy Chairman and Managing Director, R. F. Hanks as Vice-chairman of Morris and George Harriman as deputy Managing Director of Austin. William Morris was replaced as Chairman in August 1952 by Austin's Leonard Lord who continued in that role until his 65th birthday in 1961 but handing over, in theory at least, the managing director responsibilities to his deputy George Harriman in 1956. BMC's headquarters were at the Austin plant at Longbridge, near Birmingham and Austin was the dominant partner in the group mainly because of the chairman. 1953 Acquired Fisher and Ludlow, makers of car bodies. The use of Morris engine designs was dropped within 3 years and all new car designs were coded ADO from "Austin Drawing Office". The Longbridge plant was up to date, having been thoroughly modernised in 1951, and compared very favourably with Nuffield's 16 different and often old fashioned factories scattered over the English Midlands. Austin's management systems however, especially cost control and marketing were not as good as Nuffield's and as the market changed from a shortage of cars to competition this was to tell. The biggest selling car, the Mini, was famously analysed by Ford Motor Company who concluded that BMC must be losing £30 on every one sold. The result was that although volumes held up well throughout the BMC era, market share fell as did profitability and hence investment in new models. At the time of the original mergers, there was a well established dealership network for each of the marques. Among the car-buying British public there was a tendency of loyalty to a particular marque and marques appealed to different market segments. This meant that marques competed against each other in some areas, though some marques had a larger range than others. The Riley and Wolseley models were selling in very small numbers. Styling was also getting distinctly old fashioned and this caused Leonard Lord, in an unusual move for him, to call upon the services of an external stylist. Most BMC era commercial vehicles were sold as Morris but there were sometimes Austin equivalents. 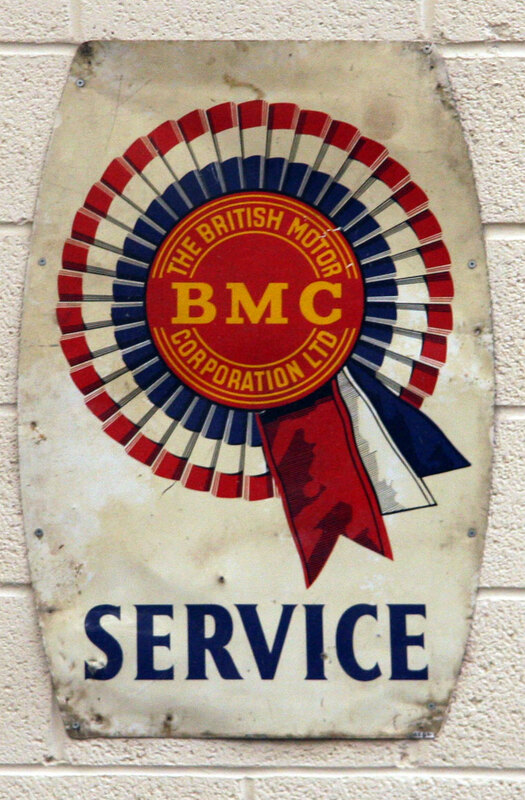 Radiator badges on the larger vehicles were often BMC. In 1956 the BMC brand was used on a 7 ton truck. 1963 Purchased the vehicle body maker Fisher and Ludlow of Castle Bromwich. 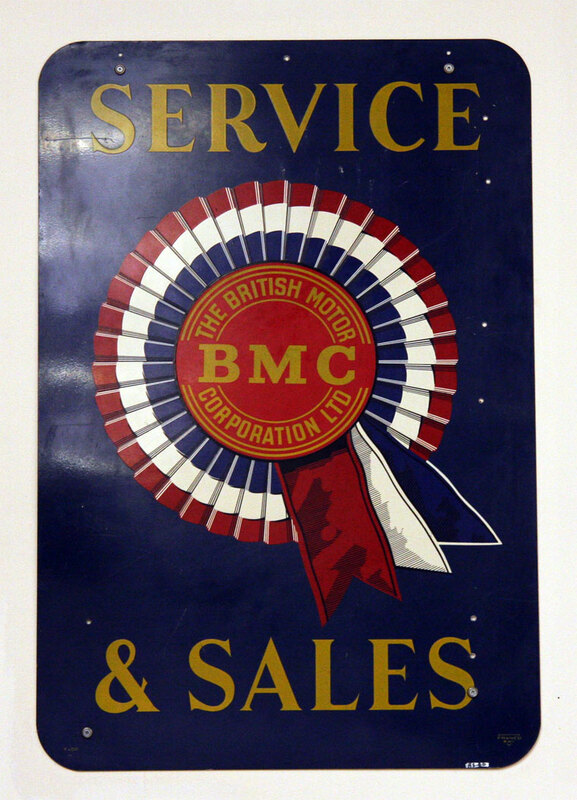 1964 Formed a new company - BMC Export Sales Ltd. to integrate the functions of the Austin Motor Export Corporation Ltd. and Nuffield Exports Ltd. with the object of further developing the effectiveness of the export effort. In 1966 the British Motor Corporation (BMC) merged with Jaguar to form British Motor Holdings. Despite this many vehicles (particularly commercial vehicles) continued to be sold under the BMC brand for several years afterwards.